Blandia came walking down the street and you could not miss her! 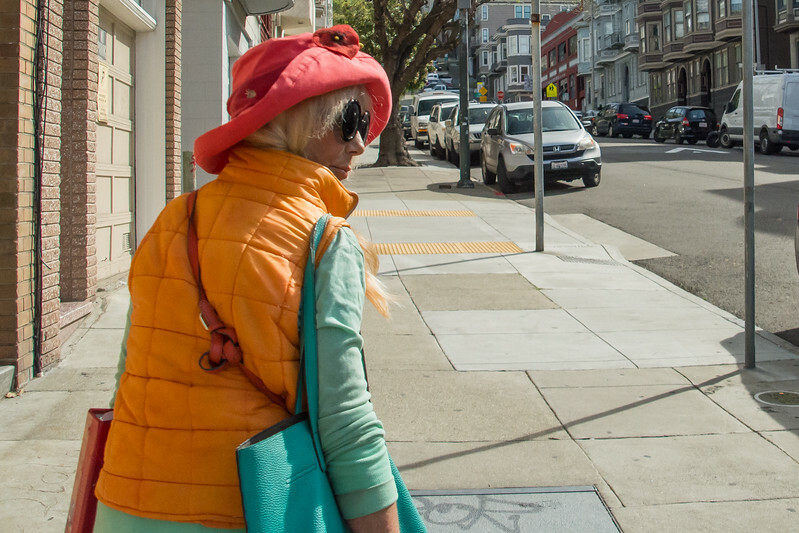 A smile on her face, oversized sunglasses, bright clothing and exuding an aura of love for her neighborhood! 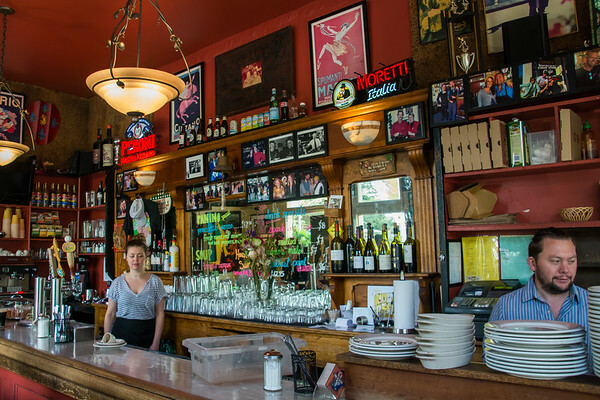 After brief introductions we started off to our first stop that was just around the corner, Cafe Roma. We sat down for drinks from the menu of our choosing, followed by getting an up close view and history lesson about the coffee roaster that is onsite. It smells amazing in the cafe and the roasting machine and process was very interesting to learn about. 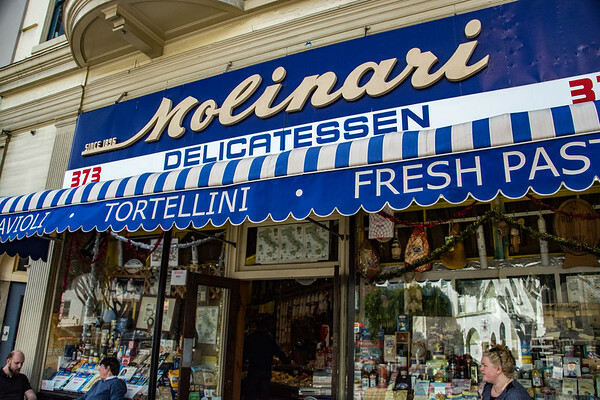 Next up our Taste of the City Tour was Mario’s Bohemian Cigar Store Cafe for a meatball focaccia sandwich (and it was to DIE for…). This cafe was very intimate and only had a handful of tables and seats up at the bar top. While we ate Blandia gave us some history behind the restaurant and we learned that the cafe had been around since the early 70s. Wondering about the cigars? Well they haven’t had any tobacco sold there in over 20 years when it was legislated no tobacco with food. Walking across the street we entered Washington Square. A beautiful and luscious green park where we saw many people hanging out enjoying the sunshine. We were able to see the sculptures that have been erected here and learn about some of the various celebrations that are held throughout the year. Moving across the next street we found ourselves right in from of Saints Peter and Paul Church. We took a very brief walk thru the nave of the church and saw the beautiful stained glass and other architectural works of art. Still full from the wonderful focaccia sandwiches we decided to walk a bit and went uphill to Macchiarini Creative Design. Nope not food by any means, but a very interesting place to visit. 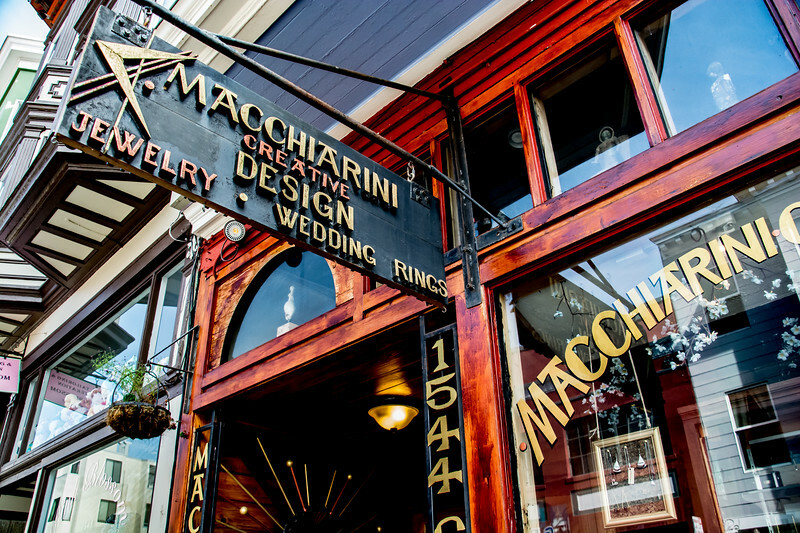 It is a family business that has been around since the 40s and they are considered masters of one of a kind metal pieces and jewelry. 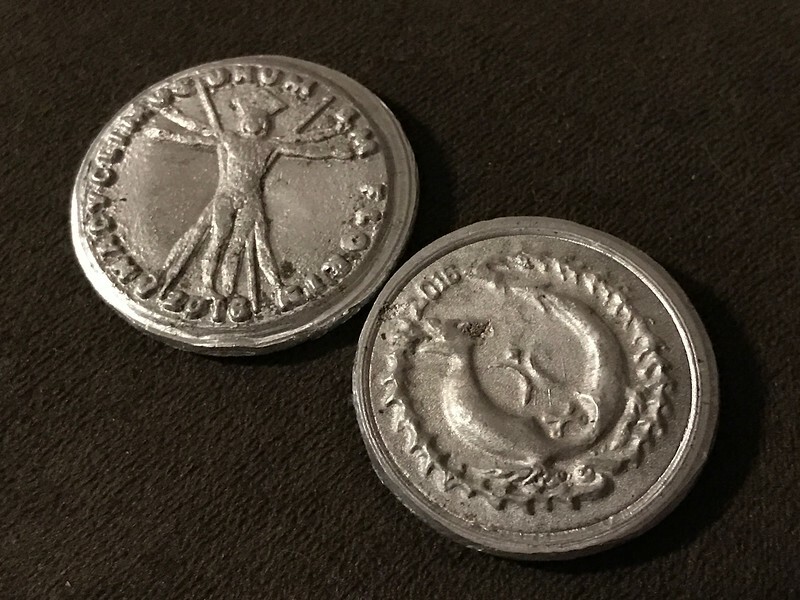 After talking for a bit, we were invited back into the workshop and had the opportunity to stamp a coin out of recycled aluminum that was finished with the designs used from the previous Burning Man festivals. We found the promise land of delis! Molinari was incredible! They were crowded and busy which we all know what that means…it must be good. We had small sandwiches, that were freshly built with the deli meats that were just sliced. So good! 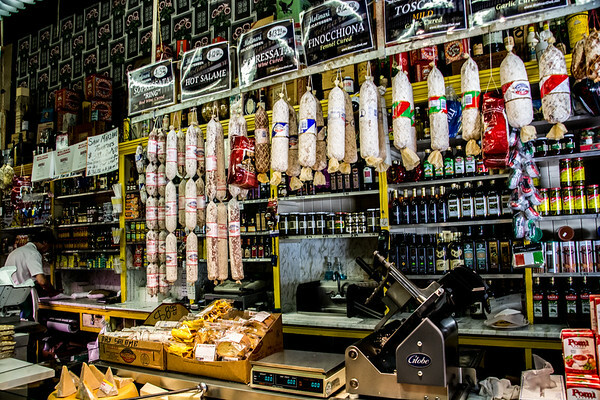 All around you can see the specialty deli meats available. We weren’t able to stay around long because the lunch rush was starting to pickup. Our next stop was a fun one…Cornology is a gourmet popcorn shop. With 8 or so flavors to try we got our fill and quickly decided that we wanted to come back and buy a full bag to take with us. They had a wide range or sweet to savory flavored popcorn, sure to please anyone that would walk in! 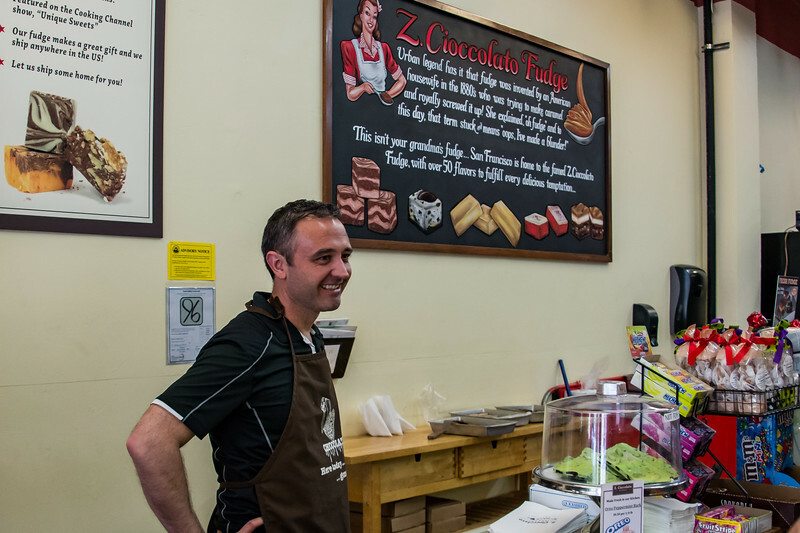 Walking into Z Cioccolato you can smell the fudge that they make in house daily. Stopping by the counter we were able to chat about the process and the flavor combinations that they had available. We were able to try a few and were given a take away bag that contained a few other samples of fudge for later. With all the eating we had been doing we were so happy to be able to have this for later! Another thing I noticed was near the back of the store they had many barrels of various other candies for non chocolate lovers. We finished off the Local Taste of the City food tour at the Mona Lisa Restaurant. They were just starting to open for lunch so we were really the only ones there but it was very good pizza and very hot! While we were eating and talking about our trip around the neighborhood Blandia snuck away for one last treat she wanted to make sure we tried…a cannoli from Stella Pastry & Cafe. The perfectly, sweet ending to a fabulous food tour! I visited San Fran about 10 years ago and ever since then have been dying to go back. This has given me the perfect excuse. That pizza is making me drool too! Nice work! We were absolutely stuffed after all the different places we went to! One thing that I absolutely loved was that our tour guide actually lives in the area so she knew everyone and had a lot of stories to tell! Love exploring San Francisco with an expert. North Beach and the Marina are two of my favorite places too. What a great tour to find out the fine details of the city. It’s so awesome to get a local take on the places we often take for granted! Such a lovely variety of food to choose from. 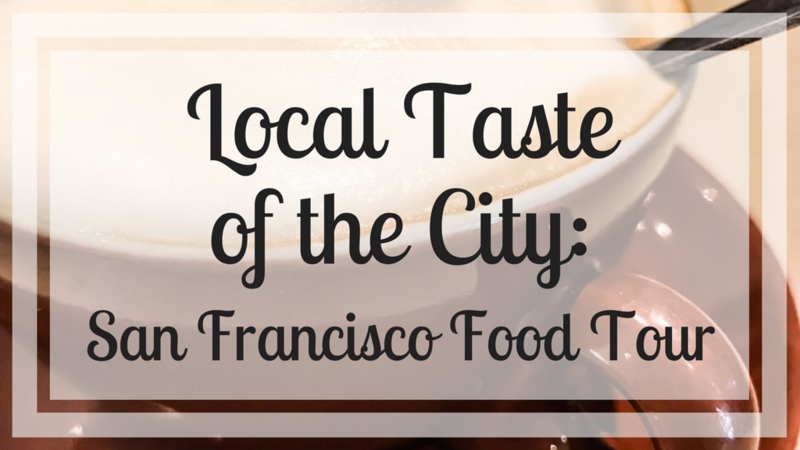 The food tour seems like a must-do when in San Francisco! I love the food in San Francisco. I wish I had known about this food tour when I was in the city, looks like a great way to explore the local cuisine. I love San Fran but haven’t done a food tour. 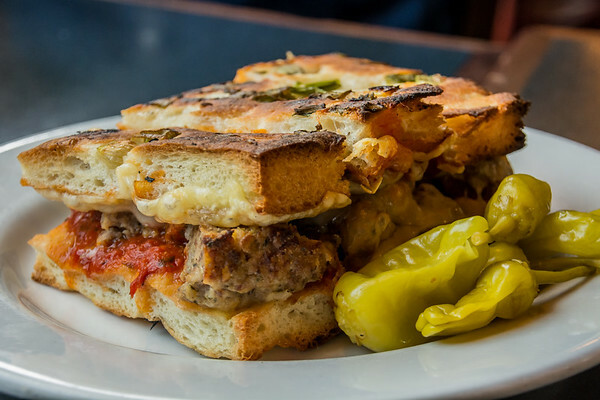 You convinced me with the to die for meatball focaccia sandwich! I’ve never visited SF but I’m getting more and more inspired to do so! Thank you for revealing those amazing places! 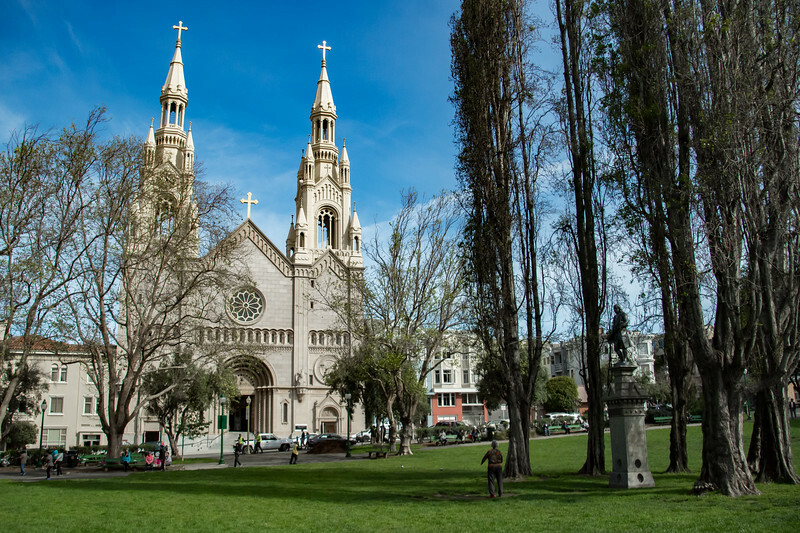 This looks like a great place to explore in San Francisco. That’s one thing that I love about tours – they force you to see things you may have missed otherwise. Looks like a tasty your indeed! If not for anything , I would go for that awesome pizza. Yet to plan to go to Frisco. One of my top 10 destinations on my bucket list. I love San Francisco, I’ve visited a few times over the years but not for over 15 years, and the last time I went, I didn’t do a great job of seeking out true foodie gems. I’d love to go back and do a foodie tour of the city with a knowledgable guide! I like that most stops are foodie but there are a few non-foodie places too, to give you time to digest, and show you the other sides of the neighbourhood. We picked this particular one because it was int he neighborhood where we were staying. I saw that there were other tours for different types of food and neighborhoods too. If I went on this tour, I would be sitting inside the CORNOLOGY store. I love popcorns and to have so many varieties of them in one place is insane. I know it sounds incredibly simple food to fall for but I have a weakness for popcorns. Simple butter popcorn is something I can live on. 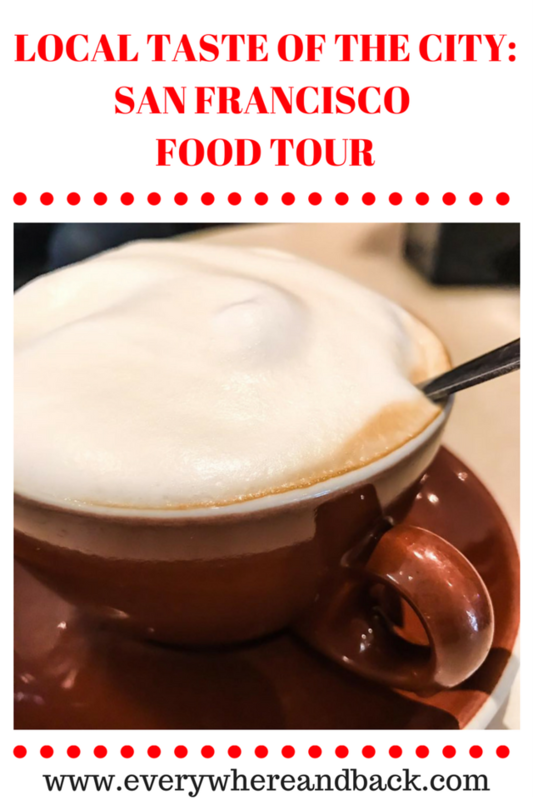 Food tours are my most favourite thing, and I always try and seek one out when I travel – this looks like a totally awesome one! Everything looks fabulous, but a gourmet popcorn shop? Yes! Please are Cornology if they can open one in London?! Food tours are so much fun because you get to hear more of the history of the area too…not just food. What a great choice of eating establishments. I particularly like the idea of the various popcorn although I am so boring with my popcorn and just want it salted. This looks like a fun trip. 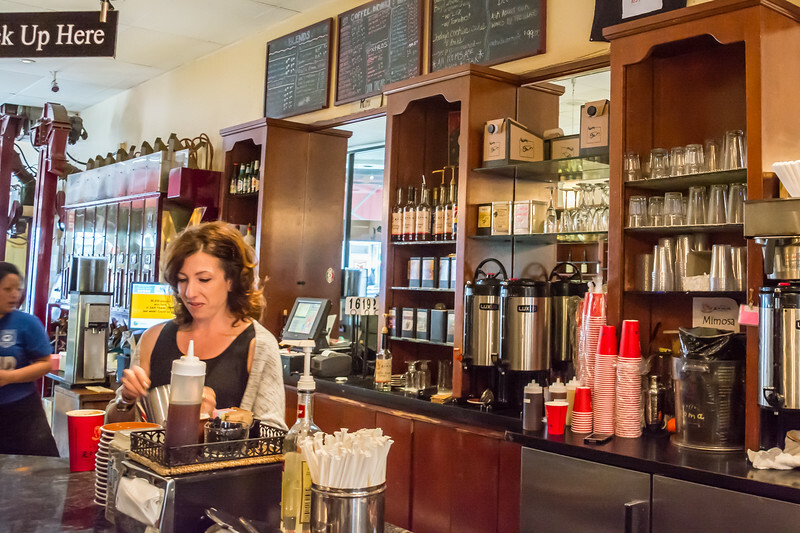 I love, love, love food tours – I’ve never had one I didn’t love. This sounds like a great one- and there’s popcorn too! So fun. Blandia sounds like a great guide! 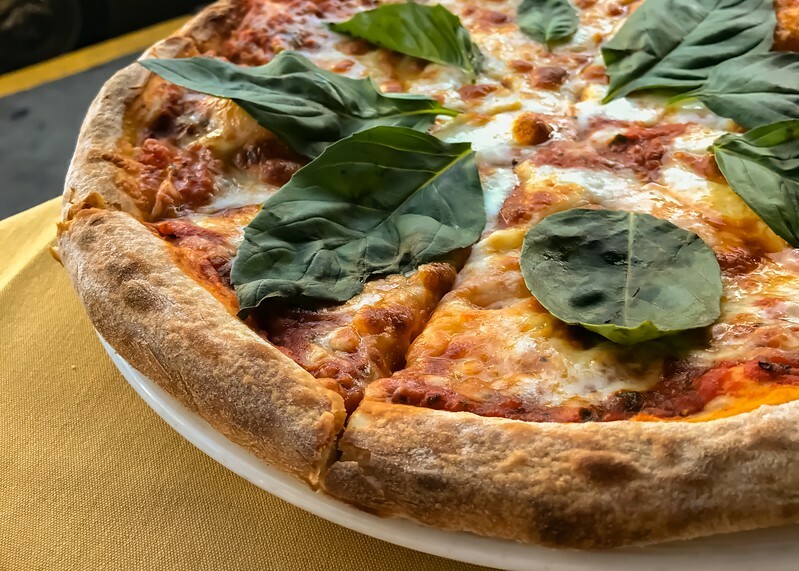 And I love how the food tour took in a bit of sightseeing of the city as well as focusing on the food – it sounds like it’s very much a two for one! 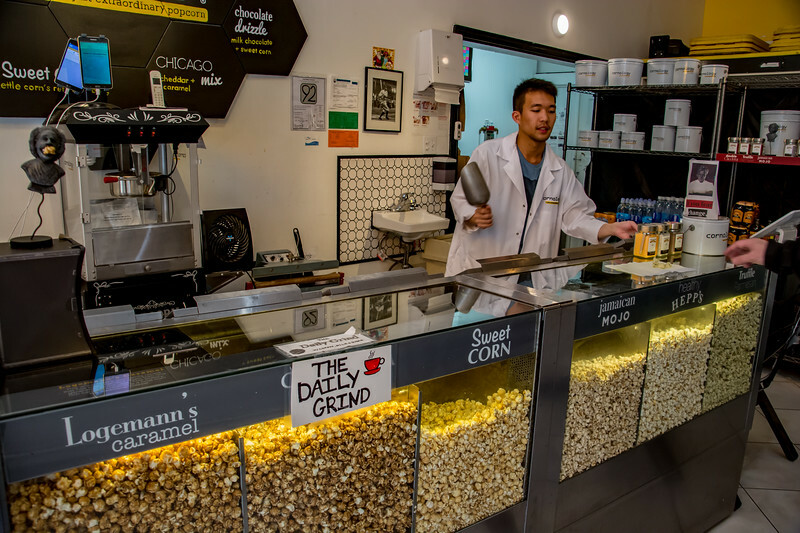 I had no idea that there was a gourmet popcorn shop in San Fran – I guess that’s one of the perks of going on a food tour lead by locals – finding out about the hidden gems! It sounds like quite the fabulous day! I love that this food tour is more than just food. That jewelry store looks so wonderful! I also love the idea of cornology. My husband is a popcorn lover, so he’d love that stop most, I think.